Hello, hello! 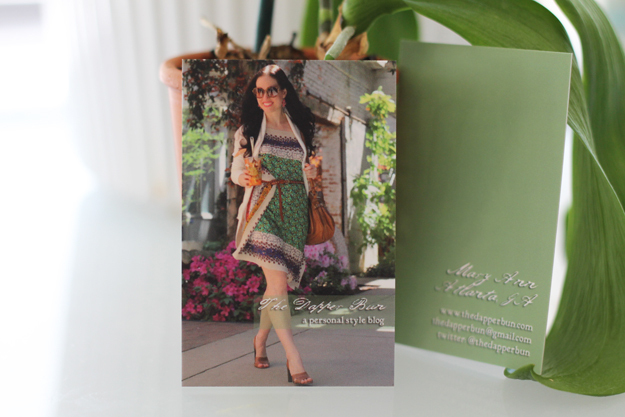 Over a month ago I blogged about a few business card ideas and I loved everyone's feedback and comments! You guys had some great ideas. After creating those five and reading your thoughts, I still wasn't totally convinced with any of them. David snapped a new pic of me a few weeks ago and it spoke to me and said, "This is it. Use me." So with my same template, I created a new card and ordered the minimum quantity (50) through Moo. I love the way they turned out and what's cool about this company, you can actually upload multiple designs per order, so even though I ordered 50 of the same design for now, next time I could use several different pictures. Anyways, I hope you like these - let me know what you think! I can always make changes and order more in the future. And just for fun, Bandit modeled for me, as well. Though I'm shocked that he remained calm and still long enough for me to pose him, focus the camera, and snap a pic without him trying to nibble on the card! Good job Bandit. OMG!!!!! what a lovely bunny! Those cards look so amazing, and are really suited for your blog. Great choice! 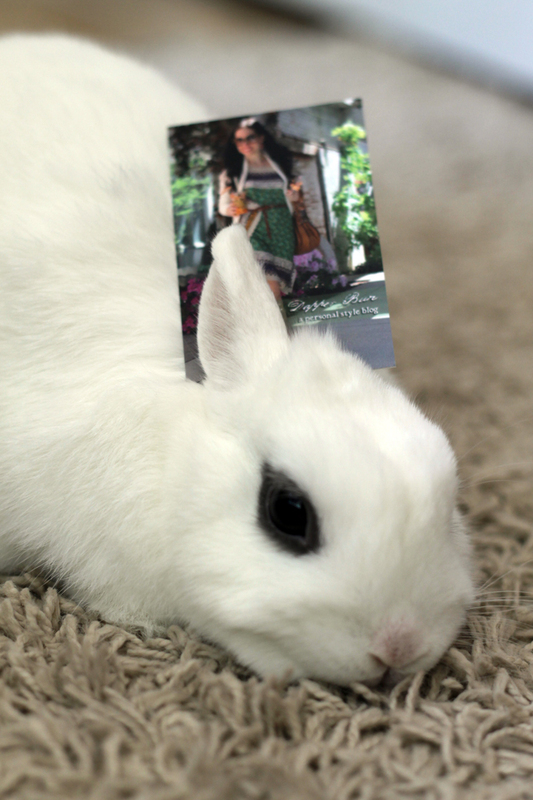 ANd what a CUTE BUNNY!!! Your business cards turned out so well and the photos of Bandit are TOO cute! Have a great weekend, Mary Ann! This one is the best!! I remember the other ones but this picture of yours looks so vibrant and full of life and I love the shade of green that you've used! Keep it for good! Love the business cards especially that last pic! with your bunny! super cute!! Love your new cards and OMG Bandit is so cute! I too love how the green stands out. They turned out perfect! Ooh blogger business cards - how awesome! And way more fun than regular job business cards! aaah the bunny is so cute!! the bunny is too cute! love the card! LOVE it Mary Ann! I totally remember this outfit and it's such a great picture of you that I think you made a great choice. And LOL at using Bandit as a prop. haha! Hope you're having a great weekend friend! I have never heard of Moo but I'm going to check I'll check it out. This card is definitely you, I love that dress and the pose. Great choice. I have heard of Moo but didn't realise you could use your own photograph for them. These look fantastic! that's a nice idea, thanks for sharing, i'll do that ,too! Great choice, that's a beautiful photo and looks great as a business card! This is so lovely. Business cards are so Neccessary nowadays. Everytime I tell people about my blog I wish I had a card. I love the lush floral it adds to your lovely hues on your dress. i think you did a great job hun. Next time use different pics options... That would be fun! Super cute business cards! Love your bunny! Such a great card, I love love the last photos, it also can be an image for the card. You have amazing bunny. I was just thinking about getting cards for my blog today! Yours turned out great! 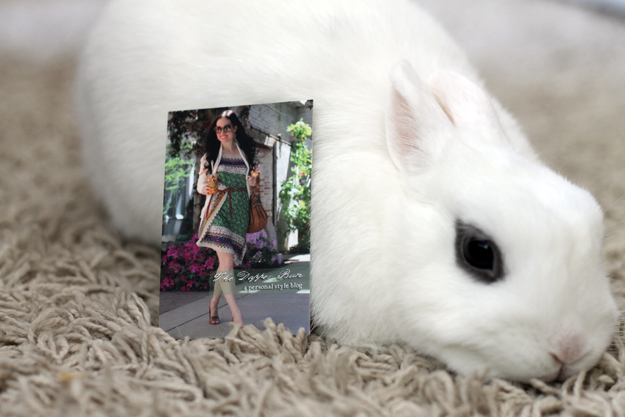 Lovely business cards and what a cute rabbit - gorgeous! Thanks for this post, I just ordered my business cards from Moo, too. I'm glad you liked the quality! That's one very lovely card in full color. No borders, huh! Amazing! I think I would love to try out something similar to that except mine is going to be an embossed business cards type of style. Do you have some Clear business cards business card to share?